We've been having a little dose of summer weather lately, which wasn't welcome at all. Luckily it's changed back to normal spring temperatures, with a bit of rain, so I'm grateful for that. I didn't like the wind throwing my pots all over the yard though, and blowing the birds out of the trees. 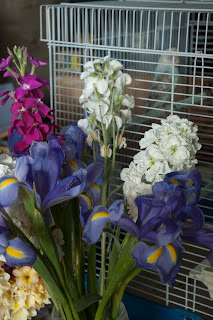 Sunday was such a wild day I just stayed inside near my sewing machine. The Log Cabin blocks are all finished, and sewn into blocks of four. It won't take much more work to finish them and then I will consider a border of some kind. I'm leaning towards these two fabrics. I know it would look lovely with a pieced border, but that would take more time to design and sew. 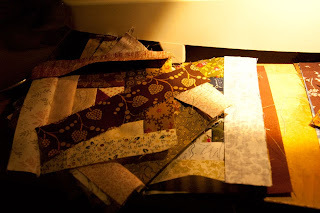 I want this quilt ready for quilting soon, so a quick border is a good border. I'm all about time-saving just lately. 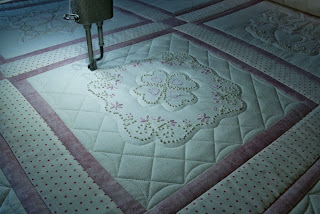 The two big custom quilts are finished and back with their owners, thank goodness. We did put a lot of work into them, I was absolutely knackered by Saturday afternoon. So many people think that we just push a button on the Statler and walk away, but it takes hours of work babysitting the machine and making sure it stitches every pattern exactly where it should. I don't leave it for a minute, which means hours on my feet. Thank heavens sewing involves sitting down, such a welcome change. I know I've spent too much time quilting when I'm itching to do the dishes and put the kitchen to rights. I let it get so messy while I'm working long hours, and it's very satisfying to finally have time to do the housework. Never thought I'd say that when I was a young'un. The pink and cream candlewick quilt was so pretty, I loved working on it, but at 110" x 116" it really stretched Millhouse to capacity. We worried about it getting dirty too, so every day we vaccuumed and wiped down all the machine surfaces, and the dogs were definitely banished. I breathed a huge sigh of relief when it's owner collected it this morning; our part in that little saga is over. No time for blogging lately, there's too much work to be done. I'm hoping that after this week we'll have dealt with most of the urgent jobs, and then I can take some time to sew for more than 15 minutes at a time. 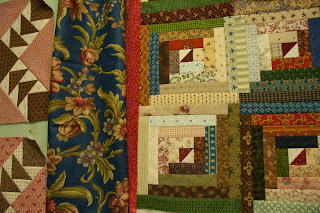 Those little amounts of sewing do add up though, I have only 1 round to add to the last 17 blocks and my scrap Log Cabin blocks will be ready to put together. I was watering the garden on Saturday evening when a little bird landed on the fence next to me. Dolly thought it was Suppertime, and tried to grab it, but I beat her to it. 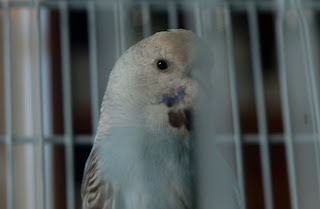 It was a battered little budgerigar, and it was in no fit state to leave out. It sat in a shoebox while I went and borrowed a cage from a friend, and then proceeded to eat what seemed like it's own bodyweight in bird seed. She was a hungry little thing. 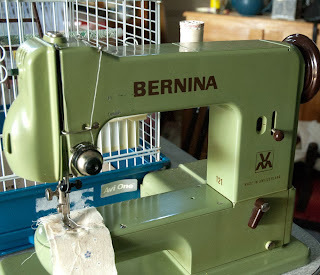 I seem to have aquired another machine, a Benina 121 in very good condition. It was for sale in the neighbouring town, and I couldn't pass it up, being so close and all. I've been so busy with work that I haven't even had time to sew on it, I'm looking forward to some playtime with this little sweetie. 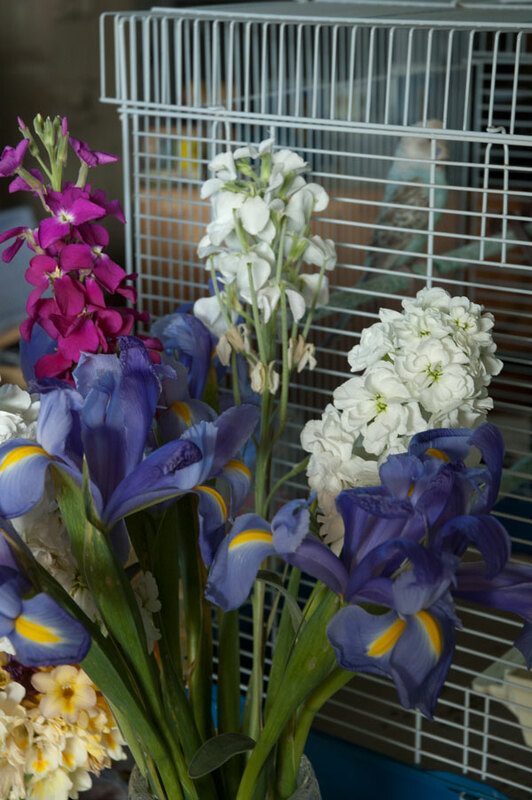 The garden is full of spring flowers, but the work is never-ending. Any spare time in daylight hours sees me out weeding or potting things on. It's very satisfying, but I feel like we're racing the hot weather this year; it's going to be a hot and nasty summer I fear. 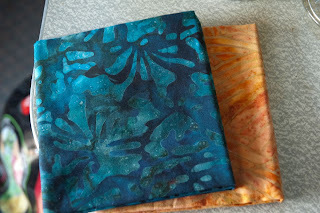 A recent trip to the patchwork shop in Jamestown saw two more FQs of batiks added to the collection. The stash is coming along slowly. I will have to start considering which pattern to use on my inaugural Batik Quilt. 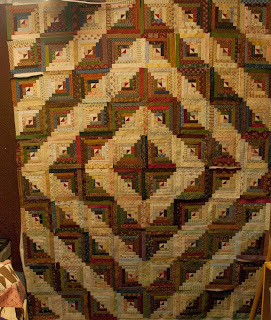 That's my spare time done for the day, off to work on two huge custom quilts. I'd rather be gardening, so I'd better get them finished quickly.